Seems like "we" just (relatively speaking) "spoke." But here we are again, with another mixtape and another series of things that don't quite rise to the level of "thoughts." It was fun, listening back to this program on a warm day--at the time of broadcast it was rather cold, as we had just endured a blizzard of semi-historic proportions. Our local Ivy League institution, which--you will never be this macho--"never" closes, actually cancelled classes, events, and staff work for 28 hours. And not a moment too soon--they made the announcement in the middle of the workday, after people had already risked their safety getting to campus. Anyway. More pertinent to us, and our shared love of tunes, it was the Ides of March. I am too lazy to look this up at the moment, but I am not sure I have done a WRFI program on this calendar date before. 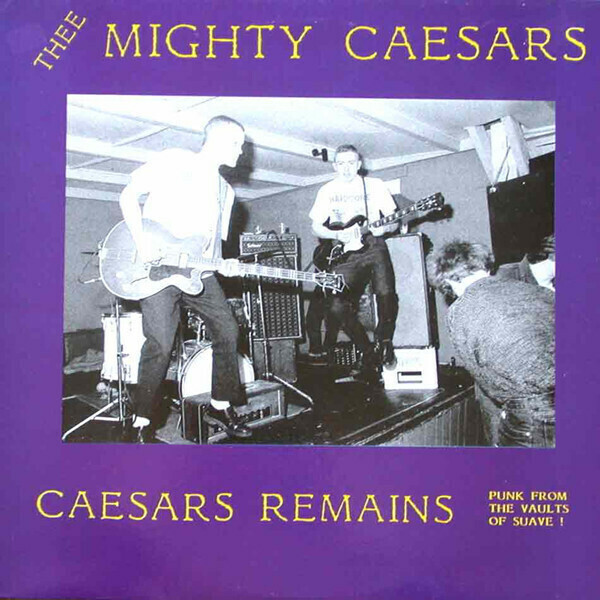 And what better to feature than a Thee Mighty Caesars record? I am nothing if not groaningly obvious. Thankfully, Lady Catharsis is also part of our crew, and her selection gives us a break from the inevitability of everything. "Ten Bears of the Comanches" | Thee Mighty Caesars | Caesars Remains | Hangman | "Physical Evidence"
"Death of a Mighty Caesar" | Thee Mighty Caesars | Caesars Remains | Hangman | "Physical Evidence"
"I Just Wanna Make Love To You" | Thee Mighty Caesars | Caesars Remains | Hangman | "Physical Evidence"
"Cadalina" | Thee Mighty Caesars | Caesars Remains | Hangman | "Physical Evidence"
"I'm Gonna Make You Mine" | Thee Mighty Caesars | Caesars Remains | Hangman | "Physical Evidence"
"The Swag" | Thee Mighty Caesars | Caesars Remains | Hangman | "Physical Evidence"
"Two Whoops And a Holler" | Jean Shepard | Hillbilly Music... Thank God! Vol. 1 | Bug / Capitol | "Listening Parlour"
"Better Off Dead" | Thee Mighty Caesars | Caesars Remains | Hangman | "Physical Evidence"
"Keep Your Hands Off My Child" | Thee Mighty Caesars | Caesars Remains | Hangman | "Physical Evidence"
"Aerug" | Pharmakustik | Pulsed Lavage | No. This entry was posted on Thursday, April 27th, 2017 at 3:06 pm	and is filed under podcast, playlist. Copyright 2012 james utz. All rights reserved.